It isn't very often we encounter technology that is really, truly new. PCs, cellphones, the Internet, multitouch. Those all changed our world when they were first introduced. Not to overstate it, but Lytro may well be the latest member of that clique. The selling point is simple: you no longer have to worry about getting a shot in focus, because any part of the photo can be brought into focus after the fact. Magic. Its guts are built on light field capture; concepts completely removed from what we previously understood about cameras. It's clearly not evolutionary. But for all the newness and innovation it brings to consumers, does it have what it takes to be revolutionary? Light field capture. If nothing else, remember those three words. It's the technology that allows you to pull any part of a Lytro-shot image into focus. But more than just technology alone, the Lytro is the first self-contained device to make use of light field capture. Prior to this, light field setups either required an array of shooters, a direct connection to a computer, or both. A light field sensor is different than a standard camera sensor. It doesn't just capture the light it needs for a static shot; it captures the intensity, color, and direction of light. As Mat Honan explained last year, it has hundreds of tiny lenses that split up light before it reaches the sensor, capturing the direction that the light is traveling in addition to just getting the sum total of the light. This is the wondersauce behind the Lytro's refocusing ability. Long story short, it's opened the door for a whole new arena of photographic experimentation. 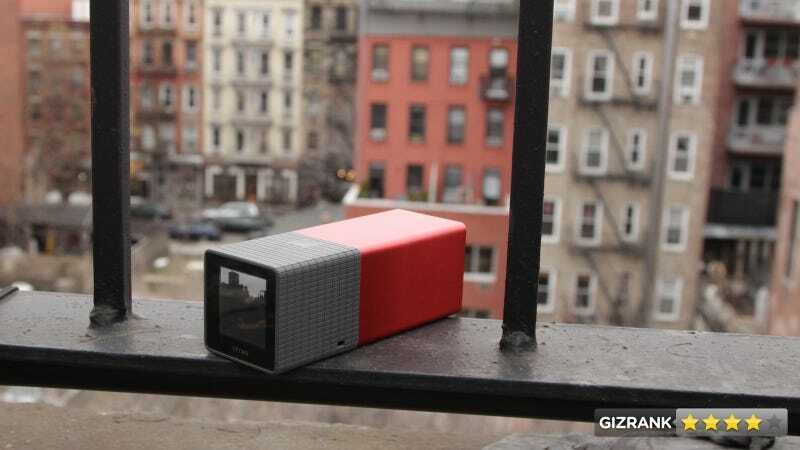 From the first moment you pick up the Lytro, it's very apparent that the thing is designed. Which is to say that thought has gone into every little detail you might consider. It's by no means tiny, but is light and pocketable, and feels solid as a steel fortress. It's meant to be used. The entire device is built around the lens array, which requires the entire length of the red anodized aluminum to function properly. The back third is rubberized, providing a nice, grabby surface for your fingers. The lens cap uses magnets to attach itself to the Lytro's body. The 1.46-inch screen is entirely controlled by touch, as is the zoom dial along the top of the body. The shutter and power buttons are placed such that when you grasp the Lytro between your thumb, index and middle fingers, you can turn the camera on, fire off a shot, and turn the camera off without changing your grip. And that helps for getting a quick, half-unexpected photo. With the camera already in hand, I can fire off a photo in 2-3 seconds from the off position, if not quicker. The UI is dead simple. Turn the camera on, and it's ready to go. Swiping to the left of the screen will bring up previous photos. Swipe a finger up from the bottom to access settings, storage/battery indicators, and the toggle for Everyday/Creative mode. Everyday mode is the quick/basic/beginner's setting which automatically controls the focal range and keeps that range in the center of the frame. Creative Mode offers access to the full 8x zoom range, and control over what/where the lens focuses on with a tap on the screen. This focal freedom also allows for a nice, de facto, macro mode as well. The Lytro has a fixed f/2 aperture and an ISO range of 125-3200 which mostly hovers between 200 and 800. Given that the entire technology is predicated on light rays—not to mention the lack of a flash on the Lytro—it shouldn't be shocking to learn that this thing craves light. The more, the better. When there's anything less than an abundance of light, image noise begins creeping in. Even in fairly well-lit rooms. Ugh. I wish this was better. The Lytro is at its best when a well-lit object is in the immediate foreground. This allows the camera to establish depth, as well as absorb more detail. When shooting at things that are distant in the frame and no object is up front, images aren't terribly rich or detailed. The camera picks up more light when you're facing away from a dominant light source instead of into it. And speaking of light, this seems like a camera geared for sunlight. Shots using indoor light come out a bit grainy, and when there's cloud cover outside, images can be a bit contrasty and edgy if not carefully-composed. Getting shots off of the Lytro and onto a computer is dead simple once you get your software set up. When the camera is connected via micro USB, images are automatically offloaded. This is important because the screen is far too small and low res to fully appreciate the images. But beware, once those images are uploaded, they take time to fully process, so it's smart not to keep any garbage shots laying around on the device. On my MacBook Pro which has a 2.26 GHz Core 2 Duo and 8 gigs of RAM, each image took around a minute. That's with Chrome, and a few other apps, like email and Twitter, open. If you want to share these photos, you can upload them to Lytro's servers, where they'll be loaded up in a Flash or HTML5 player that is embeddable all over the web, including Facebook. But the real fun is in manipulating images after the fact. Once everything has processed, a click anywhere in the image will cause a shift in focus and should produce a noticeable shift (provided the light and composition is proper). On some images, clicking a half-inch away will create a change. In one happy accident, I found that if you shoot through a window screen, you can make the screen appear and disappear when viewing (and playing with) the photo. There's a certain joy in running around outside with the camera, imagining what would make a good shot, and then running back to your computer and uploading the images to see if the experiment was successful. And if you happen upon a focal point you like, you can export it as a static JPG, which will spit out a 1080x1080 pixel photo. Not amazing, but fine for average internet purposes. results. But those with advanced photo skills can also get some powerful results from it. In good light, the camera can gather amazing detail from an object or subject—especially in a macro situation—and is capable of really great bokeh effects. Though generating smaller images, these aspects are on par with a DSLR at their best. And the ability of the Lytro to extract detail from near darkness is impressive. It may not be pretty, but it's quasi-functional as a nightvision cam. The amount of light this thing requires for truly beautiful shots is considerable. Anything less and some part of the shot will end up hazy or grainy or lacking in detail. Especially if the subject is distant. And because this file type is so new and unsupported, all the photos have to be viewed in the Lytro app or in a player hosted on their site. In day-to-day use, the quality of the screen and shape of the Lytro will also prove troubling for composing shots. Size and resolution aside, the viewing angles are so poor that it's hard to shoot anything from a weird angle or perspective because you can't see what's going on unless you're staring directly at the screen. Little design tweaks would also be nice. The zoom controls are fine, but would be better on the side of the camera instead of the top. I can't even count how many times I've accidentally zoomed while moving my hand to the shutter. And the magnet on the lens cap could be stronger. Every time it brushes against something—say a bag or coat pocket—the rubberized exterior grabs and the cap falls off. I'm legitimately worried I'm going to lose it. The Lytro is like the kid voted most likely to succeed in the high school yearbook. It's already successful, but still has tons of untapped potential. Not quite MENSA status yet, but well on its way. The possibilities for light field photography extend both into the consumer and professional fields. And the Lytro is not only a damn good first attempt, it's damn good, period. Yes, maybe it's more novel than practical right now. Yes, maybe it's expensive. Yes, maybe there's room to improve (a primary camera this is not). Lytro plans to improve its baby by adding 3D display compatibility and native support of third-party apps throughout the year. That said, it's not here now. Still, there's no denying the feeling of new when you play with the thing; like the first time you used a computer, or fired up a Nintendo, or interacted with a multitouch screen. If you're at all into technology, photography, or both—and you can afford a secondary camera—get your hands on this thing and enjoy it. Also, check out all the test shots—the good, bad, and ugly—here.